Bill Viola’s work has always seemed suffused with a reflection of meaning – the outlines of something profound are visible, and the gestures and motions and surfaces seem to reveal something, but too often end up as shimmering, depthless echoes of profundity. His work, with its increasing spectacular technical achievements and visual lustre, has always been concerned with the numinous, but he has never been a truly religious artist, and he lacks the necessary madness, the febrile yearning, of an authentic seeker like, say, Mark Rothko. 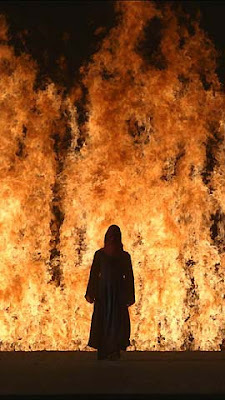 Bill Viola, Fire Woman, 2005. The works that prompt these thoughts are excerpts from a much longer work, apparently amounting to four hours of video, which was made to accompany a production of Tristan and Isolde. The works, re-christened (as it were) under a catchall title of The Tristan Project were shown in two locations, one piece in the Art Gallery of NSW and the other two in St Saviour’s church in Redfern [both until May 17]. It is difficult to know how to read these works, for they appear to be distinct vignettes, short little tales that would have been distracting to view as the backdrop to the opera, yet at the same time the extremity and size of the gestures we see are completely without context, and the grandiloquence of these movements seems hollow, like listening to the empty bombast of The Ride of the Valkyries without the surrounding Ring Cycle. We can treat these works as a whole, and they are clearly selected to rhyme with each other in more or less obvious ways. The Fall into Paradise (2005), at the AGNSW starts with a small light, the pinhole of a camera obscura, which gradually enlarges and separates into the bodies of (presumably) Tristan and Isolde, and it is revealed that the viewer is underwater, watching their liquid descent or deliquescence. Like this piece, the two shown at St Saviour’s – a gorgeous Romanesque church opposite a housing commission high rise – concern watery transfigurations. Showing these pieces in a church was an inspired choice, and the Protestant modesty of the chapel lends a monkish resignation to the works that probably wouldn’t have been visible if they had been displayed in a more secular context. Bill Viola, The Fall Into Paradise, 2005. Viola has reached a point – of skill, of funding – where all his works are expertly lit, shot, edited and conceived; these three display an easy mastery of form and a careful economy that polish the veneer spiritual depth. In the best piece, Fire Woman (2005), a woman in a hooded robe walks towards a wall of fire, and then collapses backwards, disappearing into a pool of water, before the water, oleaginous and black, slowly swallows the fire which is muted to a lambent glow and then to nothing – all this happens over a relatively brief period, but the pace is stately, the water and fire gorgeous – one is so busy being impressed that one forgets to be moved. Bill Viola’s major work, coming as it does after heroic modernism and the equally heroic deconstruction of modernist assumptions has an historical analogue in Mannerism (however disputed that term is today). Major mannerists, following as they did the heroic high Renaissance, were brilliant masters of line and form, and Parmigianino’s paintings, for example, can often seem to be occasions for ‘mere’ virtuosity – Madonna of the Long Neck being the most obvious and most brilliant. Uncharitably, one could Viola’s grandiose performances as a symptom of some sort of decline of meaning in contemporary art, but it wouldn’t be right or fair. Viola’s work is painfully earnest in its belief that it conveys some sort spiritual meaning but, if it is religious, it is with the sweet evanescence of incense from a smoking censer, not the unutterable grandeur of an icon.